Our biggest success has been the improvement and sustainability of our property. By working with the climate and not trying to go against it, we’ve become more sustainable. We get a lot of comments about why we have grass around here when nobody else has. Alice: We’ve been here at ‘Clondella’ in Firefly for 45 years. We came to Forster for a holiday and found some properties for sale around this area. When this property came up, we fell in love with it and bought it in 1965. We bought it in the middle of a drought and it was still one of the better properties. The first few years were a struggle to keep going, especially with the drought continuing. We still love it here now. We used to have a dairy farm, but we switched to beef in 2004 because of the deregulation of the milk industry. We couldn’t justify the amount of time we were working for the profit we were making. At one stage we had half beef and half dairy, and the beef part of the enterprise paid two-thirds more than the dairy part. So we pulled the plug. Our farm is an 82-hectare property and we have one beef cow for every three-quarters of an acre – that’s about 270 beasts. We grow our pasture organically. 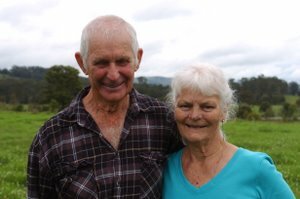 Les: We practise no-till farming and try to use native pasture and perennial pastures wherever we can. We grow some legumes for periods of time when we anticipate feed shortages, usually around February/March when we’re changing over from summer pasture to winter pasture. We have a large dam on the property and a creek, as well as about 6 hectares of forest. Alice: The climate has changed a lot in the 45 years we’ve been here. The summers are hotter and more humid, by about 1 or 2°C, because we don’t get the north-easterly wind that we used to. We’re not far from the ocean and by 1 pm, between October and March, the north-easterly wind would cool the land down. Now, it comes later in the day or it doesn’t come at all. We’ve also seen a change in weather conditions from September through to December. In our earlier years here we would get a storm about 7.30 am in the mornings. We don’t get those now, nor the afternoon storms. The storms now also drop less rain each time. I keep daily rainfall records. 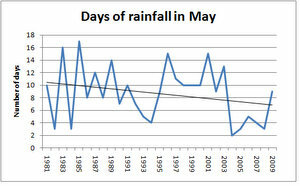 Alice’s records show that the number of rainy days in May at Clondella is trending down. Les: In the winter months, we used to get frosts nearly every morning from the middle of May through until the end of August, but last year we only had 4 frosts and they didn’t come until the end of July. They’re not as heavy, either. That’s been going on for the last 6 or 7 years now. August was always our driest month, but it’s getting wetter every year. 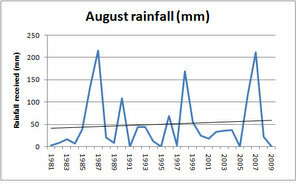 Alice’s records indicate that August rainfall at the property is trending upwards. Alice: We’ve been through three droughts here. The first one was the worst because it was not long after we bought the property and we were still learning. We had to buy in feed because the pasture was just not going to feed the cows. It was still a struggle to get through. Les: By the next drought, I’d changed to strip grazing [controlled grazing using temporary fencing] instead of set stocking [grazing a certain number of cows per hectare] the paddocks. 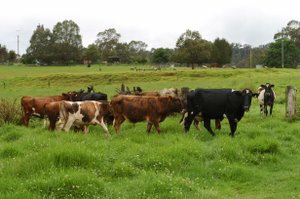 That meant we could keep a certain amount of feed all the time – enough to keep the cows going – and purchase grain when we needed to subsidise the pasture. We put irrigation in too, which helped. Afterwards, when we had enough finances, we made one of the dams larger so it had a bigger capacity. During the next drought, we went for 18 months without any rain at all, and we still managed to have the big dam one-third full by the time the drought was over. We just used it when we had to. Les: We are trying to improve our cattle by breeding for more heat tolerance. We have Zebu-cross cattle which are more acclimatised to hot conditions and they don’t seek shade like our Angus and Shorthorn cattle do. In 1976, I discovered the Australian Milking Zebu, a dairy breed that the CSIRO had bred for warmer climates. We’ve also got Brahmans and Santa Gertrudis but we’re looking to change the rest of our cattle back to the Zebu-cross for their heat tolerance. Alice: Another advantage of the Zebu-cross cattle is that they are more tick-resistant, which is good because the warmer weather has also meant more ticks. We’ve never had to think about ticks, but now we do. Les: We use perennial pastures because they stand the heat conditions better here. Years ago you could plant clover seed in the first or second week of March and not worry about it burning off when it emerged out of the ground. To germinate, clover needs a temperature of 17°C for 3 days in a row. But now we haven’t got cold enough conditions to make them germinate if we plant a little too early. 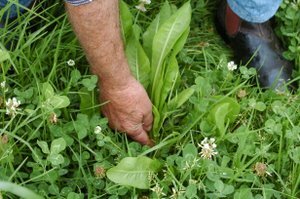 We try to make it acclimatise to our conditions by letting our pasture (mixed grass, legume and herb species) seed down (set seed and mature before cattle are put onto them to feed) every 2 years, which increases the seed quality. This also means the cattle spread the seed over other parts of the farm via their dung. That goes for any pasture seed: if you can establish them, then put cattle on and let the cattle spread it across your other paddocks instead of having to plant it, you’re a lot better off. 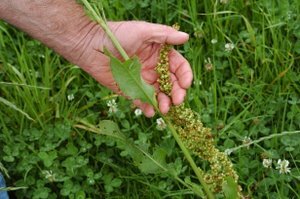 The pasture seed becomes acclimatised to local conditions, has better viability, helps saves on seed cost and replanting, adapts better to local biological and environmental soil and weather conditions, and assists with carbon sequestration. The only pasture we plant here now are legumes, which are cow peas or soy beans; these are planted during summer months if needed. Legumes help us fix nitrogen in the soil for use by grass pasture species, which helps when we are changing from summer pasture to winter pasture. Vetch is also used periodically for the winter period to maintain legumes in the pasture mixture. A lot of pasture seed in Australia is from New Zealand or the USA and it isn’t acclimatised to local conditions. So we keep looking for pasture seeds that have been acclimatised to local or similar conditions. Les: I never let the cows chew the grass down to bare ground. We always have about 100 mm cover of grass over the paddock to keep the ground cool. That’s partly how we retain moisture better and for longer. It makes about 4 or 5 degrees of difference to the soil temperature – keeps it cooler during summer/autumn and warmer during winter/spring months. You can feel the difference by putting your hand in underneath the grass and then on bare ground. Now that we don’t need to make hay, we leave the grass in the paddock. If the grass gets too high, I mulch it in as fertiliser. It helps retain soil moisture for a longer period of time and builds up bacteria, fungi, dung beetles and earthworms in the soil. Those things increase the land’s carrying capacity. Now, I concentrate more on what’s underneath the soil than what’s on top of the soil. I want to get the soil biology working so the bacteria, fungi, dung beetles and earthworms do all the work for me. 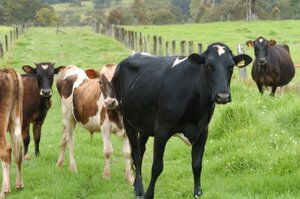 For example, as the grass is eaten by the cows, the root system dies back, allowing the bacteria and fungi to die, which increases carbon sequestration. When the new roots start to form again, bacteria and fungi re-establish themselves. This helps with deeper penetration of the root system, carbon sequestration, and keeping the soil from compacting. And it makes the work of worms and dung beetles easier. They can then bury nutrients in the soil, allowing for better water infiltration and increasing how much water the soil can hold. We have more even pasture all year round. It makes a heck of a difference. We could go here for 3 months without having to worry about irrigation. Other pastures on other properties don’t have that luxury. Our biggest success has been the improvement and sustainability of our property. By working with the climate and not trying to go against it, we’ve become more sustainable. We get a lot of comments about why we have grass around here when nobody else has. 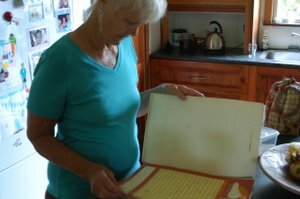 Alice: I have been keeping rainfall records every day since 1981. I read the rain gauge and write it down straightaway. I add it up at the end of the month and now we have the records on the computer as well. Les: We don’t rely on a weather forecast as much as other people, I think. I rely on instinct and watch what’s going on around the paddocks. The eucalypt trees are a good indication of upcoming temperature, because they curl their leaves up or start shedding leaves a couple of days before it’s going to be really hot. We see saw-shelled tortoises coming out of the creeks if we’re going to get floods. It is usually 3 or 4 days before it starts to rain, when the springs rise to the surface and start running. I work out a rough idea of what’s going to happen 2 or 3 months ahead, then watch the property and the grasses to give me an idea of what temperatures are coming. When we first came here we were seen as radical farmers because we used organic fertilisers instead of super phosphate. We tried super phosphate on 4 or 5 paddocks but we thought the paddocks were going backwards – there was poor pasture growth, soil compaction, a decrease in pH levels, phosphorous lock-up, loss of condition and increased handling and temperament problems of animals. We also noticed a lack of water infiltration, and fewer fungi, dung beetles and earthworms. Where we were using the organic and biological fertilisers, our impression was that the paddocks had denser, sweeter, mixed-species pasture growth, less soil compaction, higher pH levels, an increase in phosphorous availability, and improvement in the body condition of our cows. After 5 or 6 years we decided that we weren’t going to use any more super phosphate on the property at all. We now run field days and sustainable grazing groups. Both established and new owners in the area come along. They are interested in becoming more environmentally sustainable and want to learn how to improve their properties with less input costs. We talk to them about climate change, and how different weather conditions mean that we have to change our methods to be more sustainable. People are really enthusiastic about approaching sustainability.